Bluebirds check out a nestbox. Photo by Kenn of Ballwin. Many people are puzzled or excited when bluebirds (which may have disappeared in the summer after nesting season ended) show up again in September and October and visit nestboxes. The birds usually do not bring any nesting material to the box, although the female may spend some time inside. They may chase off intruders, and males may perch on the roof, wingsave and sing like they do in the spring. You may also see flocks of bluebirds. "Today...the bluebirds, old and young, have revisited their box, as if they would fain repeat the summer without intervention of winter, if Nature would let them. " "The first southbound migrants were noted during the first half of September, and until the end of the month a rather gradual, daily increase in numbers was observed. The migration reached its peak in October, when the bird was as numerous as in spring. In autumn its lisping note, uttered from overhead or from a fence post or tree, was one of the most pleasing and familiar of all fall bird calls. The Eastern Bluebird was very conspicuous during the calm, warm 'Indian summer' days of late October--such weather was called 'bluebird weather' by local sportsmen." Prospecting: previous residents scope out future nest sites or migrants passing the area get curious. 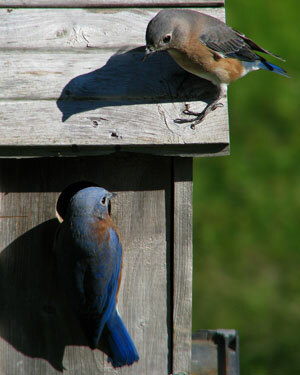 (Eastern Bluebirds may leave for migration from early September though December, depending on the location (BNA). Searching for bugs (I have seen White-breasted Nuthatches appear to do this). Roosting: Prepare nestboxes for winter roosting by sealing up ventilation holes (with removable Mortite rope caulk, styrofoam, cardboard, or a strip of wood), and/or insulating the floor. More information. Add a longer roof to extends farther away from the entrance hole. Repairs: If you opt to leave your boxes up year-round, take measurements of the various parts of your nestbox to have them handy for winter days of making repair parts. Sometimes wintering critters will chew or excavate your boxes resulting in springtime repairs being needed. By January (southern blues are real close to nesting), you should have ready various repair parts for your boxes - new interior wall liners might be needed if woodpeckers roosted. Replacement hole-guards might be needed. New box-fronts or hole repair pieces to 'fix' an entrance hole that may have been enlarged by squirrels, woodpeckers, mice, etc. By mid-winter, begin checking the fasteners that mount your boxes on their poles, to be sure none have broken, rusted, or worked loose. This can save a fallen box during nesting season. Keep an eye out over the fall for when field grasses start dying - time to collect lots of soft dead grass for IN CASE replacement nests are needed next year. See how to do a nest change. Feed: Offer suet (you'll have to train them first) when temperatures are below 40 degrees and insects are not active. Do not allow House Sparrows to roost in the boxes - this will "bond" them to the box. More on House Sparrow management. What's the reason for their warbling? Why on earth this late-year splurge? Migration tutorial by a Wisconsin ornithologist that helps you learn how to study weather maps to make out bird migration patterns. "in October, transient Bluebirds are abundant, and natives come back as if to say good-bye to their homes, and sometimes carry nesting material into their boxes, in that Indian summer of the procreative instincts that many birds evince on warm October days." Last updated January 16, 2017. Design by Chimalis.